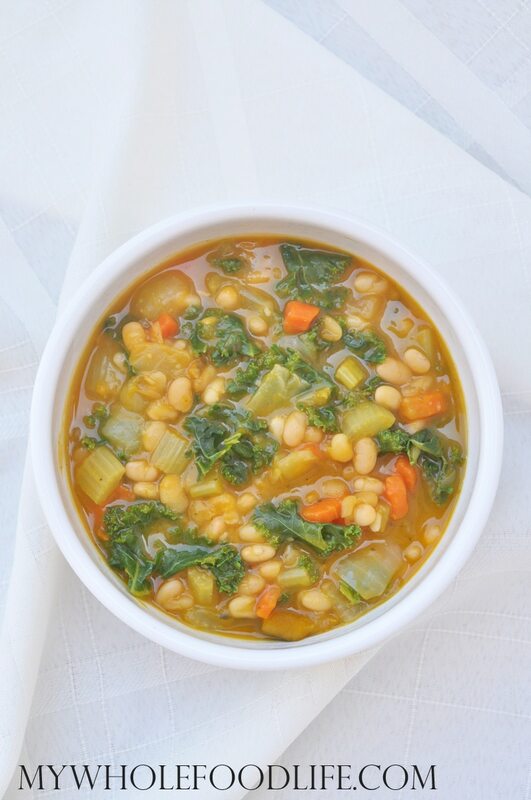 The perfect soup for Fall! Cut the squash in half, remove the seeds, brush with oil and place on a lined baking sheet . Bake for about 45 minutes. You know it's done when you can easily stick a fork through the flesh. The recipe only calls for 1/2 the squash, so freeze the other half you don't use. If you have an Instant Pot , I cooked the squash on the manual setting for 7 minutes. Just cut the squash in half, scooped out the seeds, poke holes in the squash, and place it in the Instant Pot. In a large stock pot , combine all the ingredients, except the kale. Cook covered on medium heat for 1 1/2 hours. You can even add the skin from the squash since it's edible. Remove the soup from heat. Add the kale, cover and let stand for 20 minutes. This should keep in the fridge for at least a week. It also freezes great. Enjoy! Melissa I was wondering if I could sub the kombucha squash for sugar pumkin? I got 15 out of my garden so I kinda like to use them up! Would you cook that long if using canned beans? I am new to cooking with the instant pot so when cooking the squash (I bought butternut), do I need to add liquid to the pot? You don't mention water in you instructions - just want to make sure. Sorry for the confusion. Yes I did add a little water to the bottom and then set the squash on the rack. I made this soup for my husband and myself... It is so delicious !!!!! This is definitely one I will be making quite often.... It had a wonderful flavor.. Thank you so much for this recipe. Thank you Jacky! Glad you enjoyed it. That looks yummy - and perfect for my lunches this week!!!! Made this with some minor tweaks. I pound of beans soaked yielded 5 cups for me, so I scaled everything up. I also added thyme, since I love thyme with beans and with carrots. My butternut squash wasn't very sweet, so I diced a sweet potato very fine and let it cook down into the "brothy" part of the soup. At the end I added some chipotle powder for some heat and smoke in the background. A girlfriend of mine referred to it as "a bowl of fall," which is exactly how it tastes. Thanks for a great recipe! How do you hydrate the beans? Soak them? Hi! I have an IP. Have you made the entire soup in it, i.e. did you forgo using the stock pot and cooking on the stove? If so, how long? Would it be on Manual? thank you! I haven't tried the whole soup in the IP yet, but if I had go guess, I would say cook on the soup setting for 5 minutes.